← CarFreeBrad “I’m on a BOAT”! If it ain’t fixed, don’t break it! I’ve been known to rip on the MBTA especially the Worcester station for the ticket machine being out of order for 6 months but today all is right with the world. 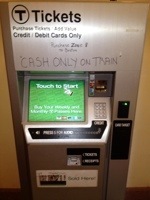 The ticket machine is fixed and even has a new sign indicating that it is the last resort for those of us who never have cash on hand. One a less positive note, does the general public know how much a monthly pass now costs to travel Worcester to Boston. I do because I just bought one. This entry was posted in Bike commute, Car Free, Uncategorized, Urban Bike and tagged CarFreeBrad, CarFreeBrad.com, Commuter rail, MBTA, Worcester. Bookmark the permalink.